click to maker bigger to see the detail. The above is the splash panel drawn by Will Elder in the very first issue of MAD, which then, in it infant stage was a comic book. That's what I say, too. Ganefs to all of you, so there. Did Mad ever leave its infant stage? Hope not. My granddaughter told me one time, with a wry little smile, that I was being "inappropriate". I told her that I have to grow old but do not have to grow up. 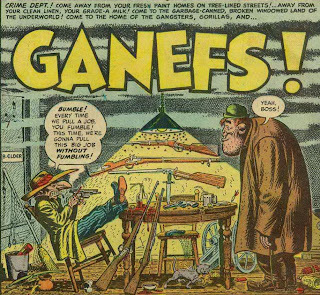 By the way, what did "ganefs" mean, if you can print it in primetime? Hope I can live up to the rascal, scoundrel part. I have the least idea what Ganefs mean. The writer/editor Harvey Kurtzman was always tossing in a Yiddish slang word. But anyway, on the internet the definition of ganef is to "rule to a flat stomach" - or "losing your stomach" - which happens later in the story. "Inappropriate" huh? That could be the name of Immaturity's sister magazine. Opps! Now I see you did some research in your next comment. Tossing your cookies is just as good. Rascals and scoundrels do that a lot, don't they.